Pigment making in the past was as complex as painting itself. The bright hues of solid colors that existed before and after the Renaissance have different sources and it is the techniques of the past that were handed down, from father to son, master to student, to the pigments now used commercially worldwide. However, there are certain pigment ingredients that were not passed on. In an effort to be the best artist, some artists who have experimented on mixing their own paint pigments have created pigments that are better than what their rivals used, and they took those secrets to the grave. Some are common knowledge and were just eventually discontinued because of the price tag. Or some just fell out of use and simply died with the society that used them. The world of colors is immense, but so are the secrets of the ingredients to make them. One of the colors that has a long history is blue. The color of the ocean, the sky, and a few other things, blue pigment rarely naturally occur in nature. The color is a trick to the eyes of the people looking at it. The sky and the sea aren’t blue because of the pigments. The butterflies are not blue because the scales on their backs are blue, but because the light that passes through them are scattered due to how fine the scales are against the wavelength of the light that hit them. So much is the rarity of blue in nature that there are only a few sources of it for the Rennaisance artists: Ultramarine, Egyptian Blue (which was eventually replaced by Prussian Blue), and Azurite. The Mayans died out without being able to popularize their own pigment, Mayan Blue. When the colonial era came the use of the paint eventually died out in favor of European blue techniques. The Mayans mixed indigo leaves and palygorskite to produce a dye that they would use as blue. Their Paracas took a step further and added reptile pee into the mix to create a binder. Red colors are easier but not to the point that people think. Certainly, however, the artists have a lot of red pigments to choose from, usually made of insects, minerals, realgar, or a gum resin obtained from Asia. Of course, the insect dyes and pigments are more popular: all manufacturers have to do is capture certain insects and dry its carcass. Such dyes came from all over the world: America, Europe, and Asia. Titian and Tintoretto made full use of such pigments. As for other colors, most of the pigments of the era were all vegetable matter and minerals mined from different parts of the world: for whites, they used Gypsum and Chalk. For blacks, different kinds of ashes and soot. Purple, though expensive and was usually reserved for the aristocracy, was made from just two types of plants instead of mixing reds and blues. Artists don’t mix colors when they’re made of different materials, so don’t expect them to mix blues with yellows to produce greens as well. Artists living today are truly privileged when it comes to their craft. They can walk into a store and buy a complete set of paint instead of buying the pigments from different merchants. Today’s paints are also ready to use and don’t need any preparation on part of the artist, or needing any exotic materials, like reptile pee, dead insects or crushed semi-precious minerals. 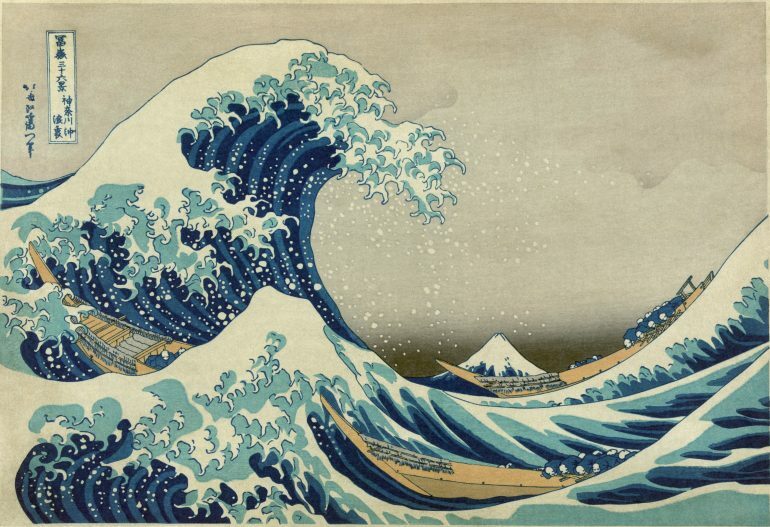 1st Image: The Great Wave off Kanagawa, using the first modern synthetic pigment, Prussian Blue. Via Wikipedia. 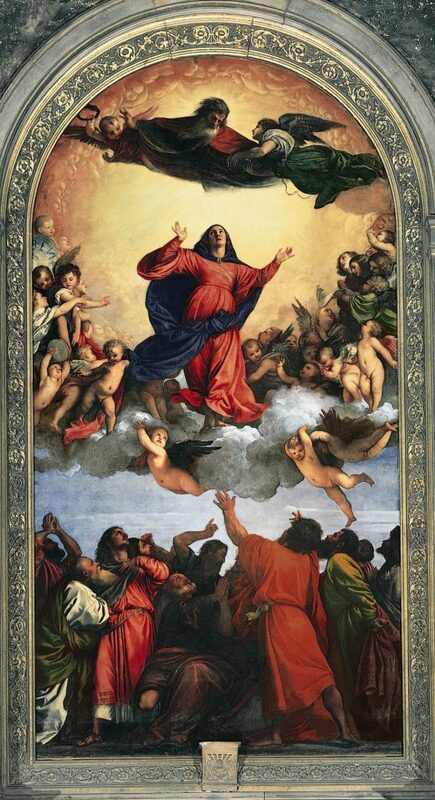 2nd Image: Titian’s Assumption of the Virgin, where he used China Red to the fullest. Via Wikipedia.